Dennis is taking along a team of four others to evangelize the city of Mérida during their annual “Carnival”. The Carnival is much like our Mardi Gras, only much more family-friendly. The biggest events of the celebration are the parades that take place over five days. (Dennis went to Carnival last year at this time to scope out the possibilities of evangelizing during this time and found the parades to be reaping with possibilities for sharing Christ with families and others as they make a day of it on the streets.) Officials estimated that last year over 500,000 people attended the last parade. Ripe with possibilities, indeed. As Dennis and the team prepare for this year’s trip (Feb 20 – Mar 1), we have some specific prayer requests. I hope that you will join myself and others who can’t physically be there as we support the mission trip with our prayers. Pray that the team will clear customs in Mexico City without incident. The picture below shows all of the 35,000 Gospel tracts in Spanish (including 20 Bibles) that they will be taking into the country. Of particular concern are the 3,000 “Million Peso” tracts and the 15,000 “Million Dollar” tracts. These tracts look very realistic but have an excellent Gospel message on the back. We’ve taken tracts into the country before, but never this many at one time and never tracts that look similar to real money. Speaking of law enforcement – these tracts tend to draw a crowd quickly; pray that during the parades the outreach will not draw the attention of police who want to break up the crowd while the teams are evangelizing. Begin to pray now for those who will hear the Gospel, that God would be preparing their hearts to hear His Word and that they will be receptive. As always pray for safe travel, good health, and stamina for the team members. Pray that God will raise up evangelists from CC Mérida to carry on the work after the team has returned home. Pray for our friends Eduardo and Mar (see November 16, 2008 blog) and Santiago and his family (see November 15, 2008 blog) – that they will attend the Way of the Master training session to help equip them for evangelism. Pray especially for salvation for Andreus (who has been feeding our mission teams breakfast for many years) and for Pillin, the professional clown who lives across the street from the church. If you read even one blog regularly, RSS is for you. It will save you time, I promise. Some of you may be wondering, “Doesn’t everyone use RSS?” The answer is no; less than 6% of internet users take advantage of this extraordinarily helpful technology. I’ve read lots of posts on what RSS is and how to use it, but they’re limited in their helpfulness. There are just too many options out there to fully explain any one of them in a post that tackles RSS as a whole. 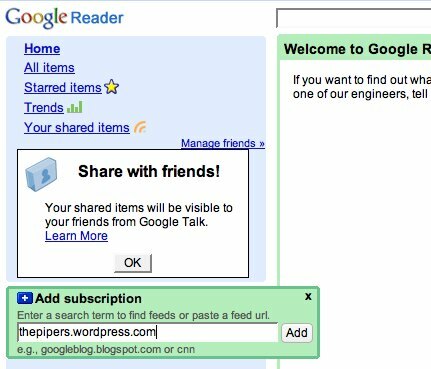 So I am going to use the majority of this article to help non-RSS-users get started on Google Reader. If you follow these instructions, you will be subscribed to your favorite sites and already saving time by the end of this article. What Is RSS and Why Is It Worthwhile? RSS is a technology that allows you to subscribe to any website that has one of these in the address bar. You can then track every site you’re subscribed to without having to go to each individual site. If you’re like me there are a couple websites that you love to read. Without RSS, I would be looking at these sites regularly to see if there were new material. Depending on how often I checked, I wouldn’t see anything new most times I visited. With RSS, I never again have to go to a site that has no new material. I subscribe to the sites I enjoy and am updated every time they post. It’s free and available to everyone no matter what computer or browser you use. It is by far the most popular feedreader that’s out there right now. On both the blogs I write for, Google subscribers are between 35-40% of the readership. 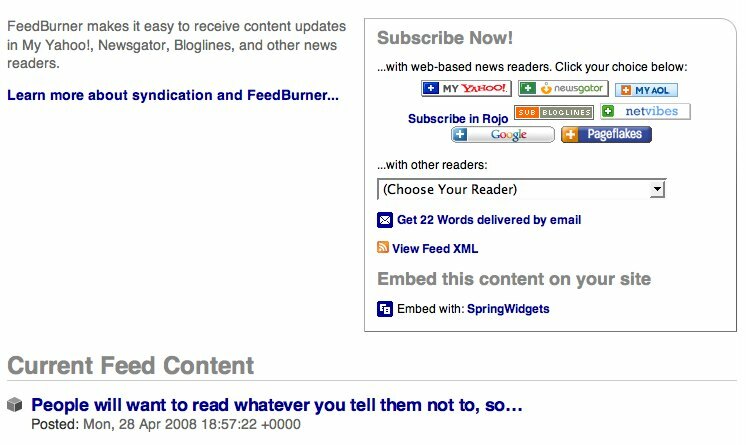 The next most popular feedreader only claims about 5% of readers. It’s really easy to use, so let’s get started. 2. 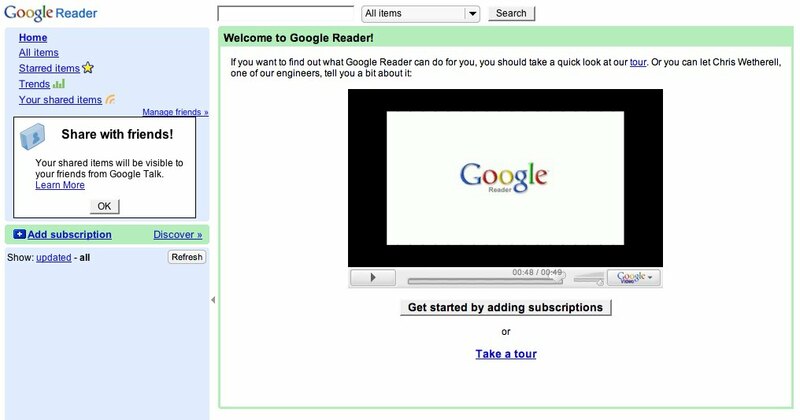 Go to Google Reader and make sure you’re signed in. 1. 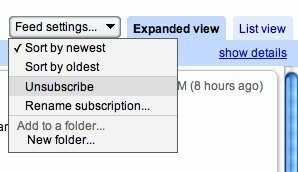 Select “Add Subscription” from the left column. 1. When you are visiting a site that you want to subscribe to, click on the orange icon in the address bar or on a link provided on the site. 2. 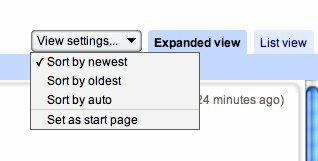 On either page, select Google as the reader you want to subscribe with. You now have a few of your favorite blogs listed in the left column of your Google reader page. The best way to go through your feeds is up to you. Here are some options. Home, at the top of the left column, is where you can see new, unread posts listed with just a few lines of content. All Items, just below “Home,” is where you can see new, unread posts listed with all their content. Selecting an individual feed from the list in the left column allows you to see new posts as well as scroll down through older ones. In the upper right corner you will see tabs for “Expanded view” and “List view.” These allow you to decide whether you see all content as you scroll through your feeds or just titles and the first few words. You will mark a post as read when you click on it. Scrolling through posts will also mark them as read, although you can turn this feature off in settings if you want to. Finally, if you want to mark all your new posts as read at once, you can do so at the top of the “All Items” page. When you change your mind about being subscribed to a blog, you can unsubscribe by going to the settings in the upper right corner. 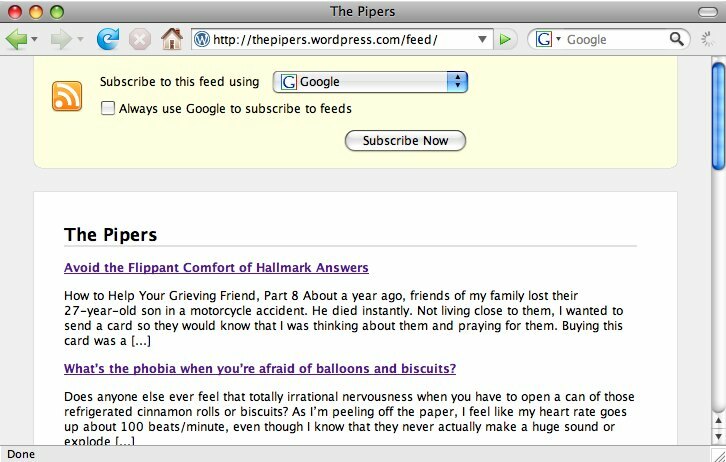 As you poke around in Google Reader, I’m sure you’ll find more nifty ways to improve your RSSing. But for now, you should have what you need to go blog wild. The purpose of this blog will be to post website updates, announcements, prayer request and articles we feel will exhort and encourage our congregation spiritually. We will also be posting articles, links, or more resources that the elders mention during their sermon.